The Cyclery-Opus is proud to announce the signing of Tara Whitten (34, Edmonton, Alta.) for the 2015 season. Whitten is one of the most decorated Canadian cyclists of all time, counting an Olympic Bronze Medal, three world titles, and overall World Cup title, numerous national titles, and a Commonwealth Games time trial title to her palmares. Whitten is returning to racing next year with a focus on time trialing and the goal of an Olympic medal in Rio in 2016. The Cyclery-Opus is excited to help her towards achieving her remaining goals in the sport. "I am very excited to be racing again this year, and the Cyclery-Opus team is a perfect fit for me. I am looking forward to training and racing alongside this talented group of developing athletes. Jenny Trew and Chris Reid have really built something special here, and are contributing so much to the development of women's cycling in Canada. I feel fortunate to be a part of it!" said Whitten. As importantly for the team, Whitten is a fantastic role model for the team's younger riders. Balancing school and riding is a reality for most Canadian cyclists and Whitten has done both with excellence - she is currently finishing off her PhD at the University of Alberta in Edmonton. Moreover, despite her athletic successes, Whitten has remained a humble and approachable person - what better Canadian to serve as a role model for Canada's next generation of elite cyclists? The Cyclery-Opus team aims to help Canadian cycling talent navigate the difficult gulf between the Junior and regional level into international and professional racing. Canada has always had the talent, with a great history of female racers, but all too often there has not been a pipeline or structure to help them advance - with most having to move to the US or Europe to chase their dreams. Many more talented riders slipped between the cracks along the way. Though an amateur squad, the team tries to foster a professional environment and culture of teamwork that will serve the riders well later in their careers - both on and off the bike. 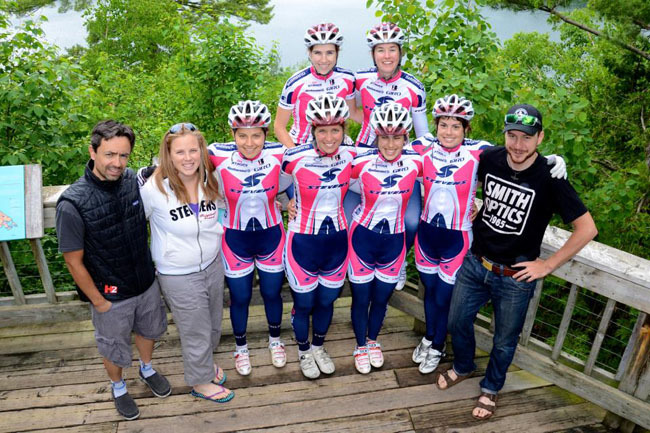 Back for a seventh consecutive year, one of Canada's best women's road teams is changing title sponsors for the 2015 season. After six successful years on Stevens brand bicycles the team will be deepening its relationship with Canadian brand Opus and their distributor Outdoor Gear Canada. Primary backer The Cyclery takes over the role of title sponsor as the team continues to evolve into one of the premier avenues for developing female cycling talent in Canada. The store is the premier bicycle retailer in the Ottawa area and has a reputation for excellent sales and service - as attested by their three consecutive Best Bike Shop Awards from Canadian Cyclist. The team will race on Opus Vivace bicycles, and will continue their longstanding relationship with Giro, wearing their helmets, gloves, socks and shoes. Returning as well are supporting partners Smith Optics and Biemme clothing. The team will also continue their relationship with Stages power meters which allow team members access to affordable and reliable power data as they continue their development. 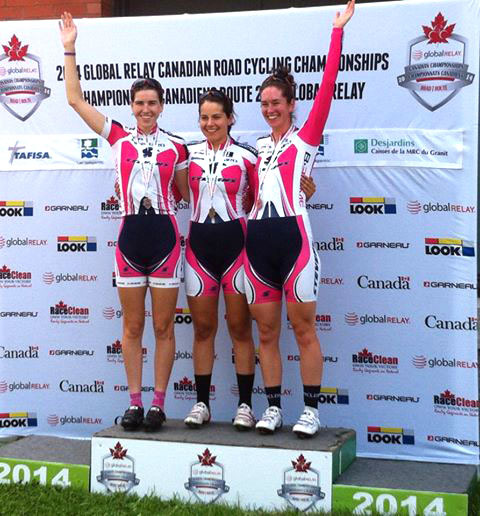 The 2014 season was one to remember, with over a dozen wins, including three Ontario titles, a Quebec track title, a general classification win at the Syracuse Race Weekend, a podium sweep in the inaugural Street Sprint event at the Canadian National Championships and podiums in New York, Vermont, Ontario, Quebec and New Brunswick. The team produced six top-10 performances at the elite Canadian National Championships road race, time trial and criterium, and had the top two non-professional finishers at the Chrono Gatineau UCI race. The 2015 team is a mix of up-and-coming Juniors, talented Espoirs and elite national team members, guided by a former World Champion and Olympic medalist. The core of the team returns for the 2015 season, spearheaded by New Brunswicker Ellen Watters (26, Fredericton, N.B. ), who last year posted strong time trial results at both the Canadian Championships and Gatineau and emerged as a regional power in stage races with an overall win at the Syracuse Race weekend and top-three performances in stages at the Killington Stage Race. 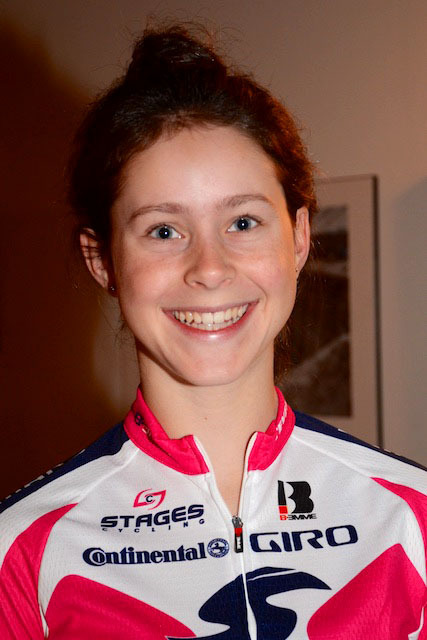 Look for Watters to continue her rapid rise as a GC rider in 2015. Emily Flynn (21, Ottawa, Ont.) emerged as a sprinter in her own right last year, winning the Provincial Criterium Championships and taking a string of podiums at Good Friday, St. Martine and the Tour de Syracuse. 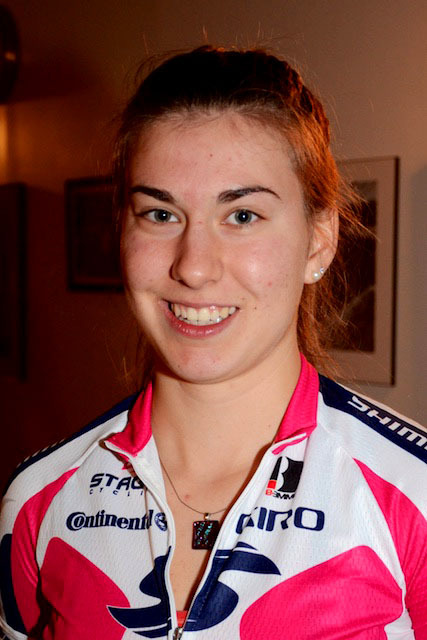 Former national champion Ariane Bonhomme (19, Gatineau, Que.) has weathered a difficult transition year into the elite ranks last season after representing Canada at the Junior Track World Championships in 2012 and 2013. But her perseverance was rewarded with a breakout performance on the velodrome at the Los Angeles Grand Prix, where she finished second in the scratch race - one place ahead of the reigning World Champion. Amélie Bruneau (20, Laval, Que.) played a key support role for the team last season, and was instrumental in the team's podium sweep in the Sprint event at the National Championships. She improved throughout the season with a strong ride in the UCI Tour de Delta. With two years left as a U23, look for Bruneau to make some waves this season. Véronique Parent (17, Quebec, Que.) returns as a development rider for 2015 with a heavy focus on endurance track. The Junior Quebec Track Champion, Parent has another year of junior left to make her mark. Junior National Criterium Champion Katherine Maine (17, Ottawa, Ont.) joins the team after a fantastic first year in the Junior ranks that saw her win a national title and participate in numerous National Team projects. A logical fit for the team being from Ottawa, Maine has been on The Cyclery-Opus team director Jenny Trew's radar for some time, attending numerous camps and rides with the team over the last year. In fact, The Cyclery helped provide the bicycle that Maine rode in Belgium last year with the National Team. Marie-Pierre Nadon (18, Timmins, Ont.) will be relocating to Ottawa to race with the team next summer. This Timmins native has made the switch from the mountain bike onto the road, and the team is excited to see what she can do in her first year as a senior rider.